You might be like 'Ely, haven't you already posted like six TBRs for the month of June?' and you'd be right, but the thing is, dear readers. I really, really like TBRs. I also have a eight hour flight, followed by about six hours stopover plus another twelve hours flight ahead of me tomorrow so I feel like I deserve this. 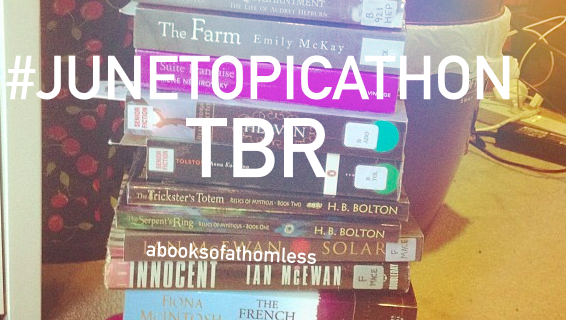 This particular TBR is for the June TopicAThon which is hosted by the lovely Miriam of Between Lines and Life. The read-a-thon will be running for the 8th of June until the 14th. The hashtag #JuneTopicAThon will be on Twitter etc. I'm not entirely sure how active I'll be on social media, due to that long haul flight but also because jet lag and the fact that I'll be staying with family that week. I'll try my best to do an update at least once a day. As the name suggests, this read-a-thon involves picking a topic of books and then reading books from that topic in the week. For example, you could pick all fantasy books, or all books by Jane Austen or whatever. I decided to pick literary fiction as my topic. You might know that I read mostly YA, with some classics thrown in, so I thought I'd branch into a genre I don't usually read from this week. I've picked ten books out, which I know is a lot for one week. Yes, I am a speed reader but ten books is even too much for me. I just wasn't really sure which ones I would end up reading so I wanted to give myself some options. Naturally, these will all be on my e-reader so I can read whatever takes my fancy at the time. That was a really long introduction, wasn't it? Should we actually talk about the books? 1 - 4. Purple Hibiscus/Half of a Yellow Sun/The Thing Around Your Neck/Americanah all by Chimamanda Ngozi Adichie. 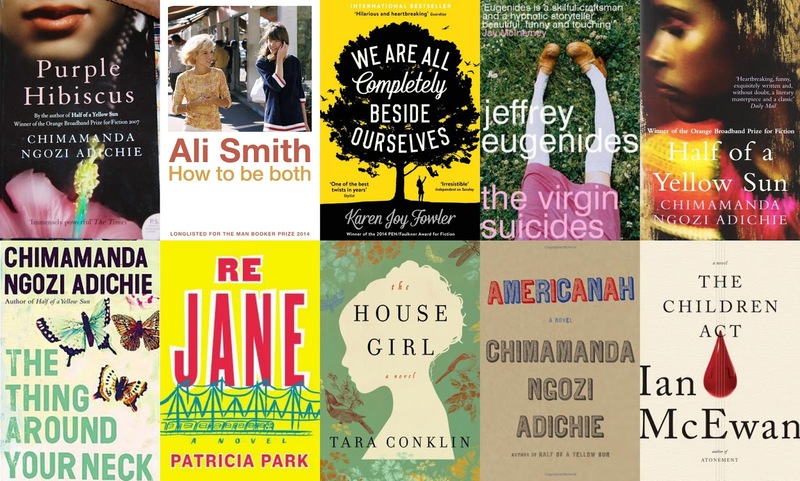 I think these are all of Chimamanda Ngozi Adichie's published novels at the moment. I really like Chimamanda as a person, and I've previously read the first 150 pages of Americanah which I loved (but sadly it had be returned to the library) so I think it's time I read at least one of her novels. I haven't read any of Ali Smith's work either, but I've heard some great things about her. How To Be Both is the one I've heard most about so I figured it'd be a good place to start. I've seen this one everywhere the last couple of months and I've almost picked it up so many times. I know absolutely nothing about it except that it has a pretty cover! I've never read any Jeffrey Eugenides either, but I've been meaning too for ages. I've heard some pretty good things about this one, so I thought I'd give it a go. This is a modern day retelling of Jane Eyre set in Queens. What's not to love? I believe this is 1850's America and it has something to do with a girl trying to leave slavery...maybe? Honestly, it's the cover that reeled me in. Ian McEwan is one of my favourite authors, and Atonement is one of my favourite books of all time so this needed to happen. The only reason I haven't read this already is because it was ridiculously expensive at Dymocks. So those are my ten options for the #JuneTopicAThon. I don't know which I'm going to start with, or how many I will get through but check back after the 14th to see my wrap-up! If you're participating, let me know what you're reading. June Wrap Up: Shortest Wrap-Up Ever? The Vlog/s From YA Matters is here!